ELKHART LAKE, Wisc. – For the first time all season, a podium finish felt like a disappointment as a win just slipped through the fingers of the No. 67 Ford GT team of Ford Chip Ganassi Racing. 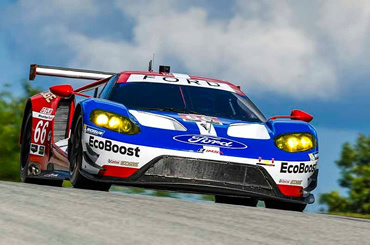 Co-drivers Richard Westbrook and Ryan Briscoe, who were set to start p3 in the Continental Tire Road Race Showcase at Road America on Sunday, had been sent to the rear of the field after a ride height penalty wiped out their best qualifying lap Saturday afternoon. Meanwhile, the sister No. 66 Ford GT that had qualified on pole encountered a suspected suspension failure right after the start of the race that sent Dirk Müller to the pit for a fix and set the car back four laps. Meanwhile, while all eyes were on the No. 66, Briscoe diligently worked his way through the field to the front and Ford Chip Ganassi Racing took the lead for the first time when they pitted for a driver change and Westbrook beat the leader out of pit lane. They kept the lead until the final minutes of the race. Just when it seemed they’d take another checkered flag, the No. 67 went down on power and Westbrook was overtaken shortly after the final restart to finish p2. Joey Hand, Müller’s co-driver, brought the No. 66 in p9 in class. “We had a brilliant start at the beginning,” Müller said. “I knew it was going to be tough because of just the pure acceleration. The competition is really, really strong. I knew I’d have to be patient to bring the tires up. I was p2 going into Canada Corner and everything was under control. I was already thinking ahead. I had a big smile on my face. I thought it was going to be fun. Then while I was braking, something went funny on the front right so I couldn’t really take the corner right. The steering was far to the right. I had to let people by at that point. We decided not to pit right away, just so we could figure out what was going on. Then it just got worse and I went off track. We gained laps back later with strategy. That was a shame. We should’ve been on the podium. Congrats to the No. 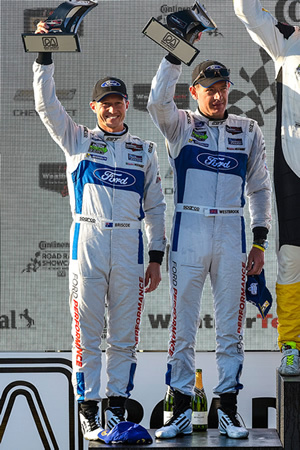 67 guys on another podium.